The Equestrian Club of St. Catharine of Siena School in Reading, Pennsylvania wrapped up a successful season on Tuesday, May 29, with a blue-ribbon awards ceremony and ice cream party. 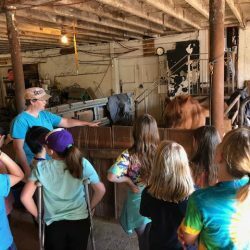 The Equestrian Club, open to grades 2 through 6, met weekly throughout April and May to learn about equine care, culminating in several field trips to Corner House Farm where they were able to get some hands-on training in safety, leading and identifying colors up close. The Equestrian Club is moderated by avid riders, Mrs. Lisa DiBerardinis, (also a 4th Grade Teacher) and Mrs. Fran Wade-Whittaker, mother of a St. Catharine student. Participants in the Equestrian Club took part in a step program with the first step testing them on safety around horses, how to feed a treat, leading a horse, colors, and parts of the saddle & bridle, with those passing receiving a Blue Ribbon award and certificate. Assisting the moderators in testing the students was Louise Jordan-Beam, owner of Corner House Farm, a 25-acre horse farm in Douglassville, Pennsylvania. Louise, originally from Scotland, is a British Horse Society registered Assistant Instructor and United States Accredited Professional Coach. Louise has 6 horses and ponies on the farm used for lessons and competing. The Equestrian Club is just one of a robust schedule of extra-curricular activities available to students at St. Catharine of Siena School, an inclusive, culturally diverse Catholic School with 248 students from Pre-K through 8th grade.